Many naturalists are familiar with the bizarre and often colourful oak apples, marble galls, robin's pin cushions, rosettes and bean galls on oaks, wild roses and willows, and wish to discover more about them. There are many other galls too and, in order to investigate them further, the first task is to name them or, more precisely, to name the organism that induced the plant to produce the gall. The publication of the first edition of "British Plant Galls" in 2002, itself building on an earlier guide produced in 1986, stimulated more interest in plant galls, resulting in the discovery of new galls and galls that had been inadequately described or illustrated. This 2nd edition includes revised and expanded keys to incorporate the changes in nomenclature which have accumulated since the first AIDGAP guide was published in 2002. Additional galls have been illustrated and many figures replaced. 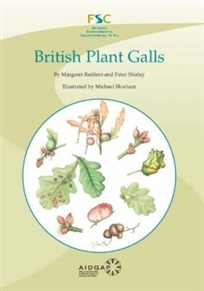 This guide allows identification of all the common plant galls found in the field in Great Britain, and contains some 300 keys grouped by gall causer (bacteria, mycoplasma and viruses, fungi, plants, nematodes and arthropods), and then subdivided according to host plant genera. The second major change in comparison with the 2002 keys, and reflected in the title, is that galls on fungi and lichens have been omitted. Many galls on these hosts are now known, some caused by insects, but most caused by other fungi, and limitations of space prevents their inclusion here. The intention is to include galls on fungi in a future companion volume.